Behind every reliable network, you’ll find good office cabling. Office cabling is an investment for the future. On average, office cabling solutions remain in operation for ten years or more. This means that requirements for future applications must be assessed and taken into account right from the initial planning phase onwards. Our trained and experienced technicians understand the importance of having a quality, reliable office cabling structure. We will design and engineer your cabling system ensuring it meets our strict installation guidelines. Moving offices-or even organizing an existing one-involves countless potentially stressful details. If you’re in the middle of such a project, you have much more to think about than your company’s IT system. 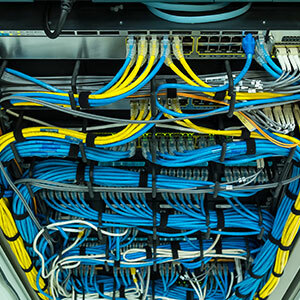 So, our team excels in the design and installation of structured cabling solutions for both data and voice networks. No matter the scope of your project, we offer the following network cabling services and products. Therefore, this means that requirements for future applications must be assessed and taken into account right from the initial planning phase onwards. Whether primary, secondary or tertiary cabling, whether fiber-optic or copper cables. Hence, as a full-service provider, Mavis Group creates future-capable solutions for high-performance office communication. So, one of our friendly and professional technicians can provide you with no obligation cabling suggestions to connect your office and enhance your ethernet experience. No obligations since we provide free quotes.